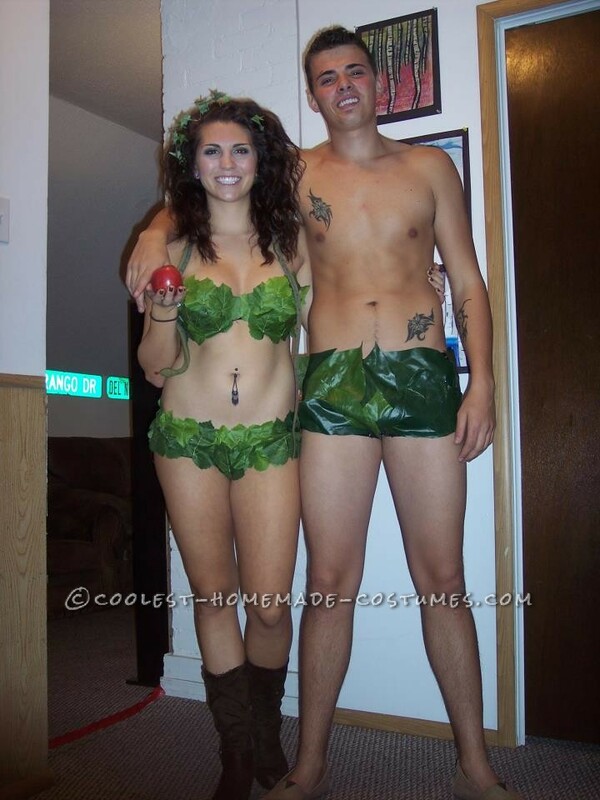 Adam and Eve couple costume, easiest costume I’ve made! All we did was bought leaves from Hobby Lobby, but it was the leaves off the branch so we had to cut the leaves individually. Then get a pair of boy shorts and strapless bra for the top and boxers for the male. The next step to do is basically start sewing. We prefer small leaves, they work a lot better! You can hot glue but make sure to double layer your undies because the glue can get super hot! Now after the costume is sewn it’s time for the finishing touches, borrow a few plastic snakes from your niece or nephew and carry around an apple until you get an appetite. And enjoy! My fiance and I went this year to our friends Halloween party as Adam and Eve and we had a blast reenacting being the beings that created this world!